Good family car safe and easy to drive. It is very spacious on the inside and lots of head room. Good for families and there is enough trunk space to carry groceries and larger items like strollers bikes bodyboards. Seats are water resistant so easy to drive and easy to clean the interior. Sometimes it is hard to let out the back passengers out easily because you have to open the front door first so it creates a tight space. There are some major blind spots where the plastic covers. The plastic on the outside has a tendency to oxidize so you have to keep polishing it. The car drives well and handles turns easily even though it is a box shape. We keep getting notices about our air bags being faulty and we call those numbers and they never answer! Is that a scam to get us to bring our car back to the dealership? Use better windshield wipers the ones on the car are not very thorough cleaning the rain. Overall this car is good for families and drives well. 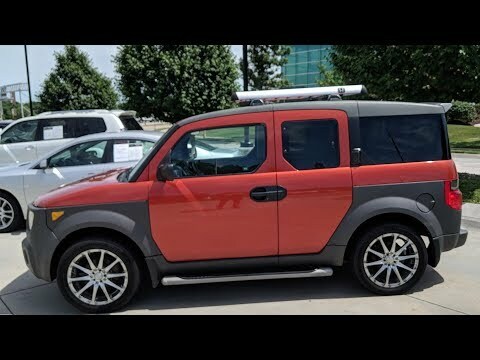 I love the Honda element: here’s why. This car is not actually mine, but it is the car that I drive the most often. I learned how to drive in this car and it is the easiest car to drive in my opinion. I like how it is higher off of the ground than a sedan because I find it easier to see the road and I feel safer for some reason. I also like how the back of the car is flat because it makes seeing cars behind me easier. Finally, the interior of the car is super nice. I like how the back seats are a little elevated so people in the back can see out of the front window and there is also a lot of leg space which is good for my tall family. The back seats also collapse so if you need more trunk space you can move the seats and have extended trunk space to carry furniture, suitcases, trees, etc. One all around great versatile vehicle. Bought it used in 2012. Love the way it looks and handles. Especially in the snow. It looks like a regular vehicle but you can easily turn it into a cargo van by manipulating the rear seats Accordingly. My neighbor hauled a washer and dryer in it. So much room! Only thing I don't really like are the suicide doors. Makes it hard to maneuver your grocery cart in between the doors to load the car. Other than that I wish they still made this model because I would buy it again in a heartbeat when I am ready for another vehicle. Am going to hang onto this one as long as I can.